The Tiny Skillet: Tailgating Time ~ The Playoffs! Tailgating Time ~ The Playoffs! Time for the playoffs and Tailgating Time week # 18 - Time for football, good food, and a pitcher full of cold ones! Everyone is getting ready with some great ideas for The Super Bowl! Bring over your famous recipes for you favorite foods and party things! Slight delay with the "Linky" this week, if you would like to leave the link in a comment or you can post it later when we get the linky posted. We always appreciate our loyal friends who join us each week!! 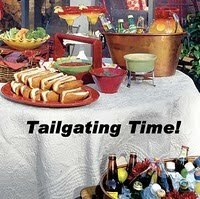 Those of you who are new to us or are Tailgating Time time regulars! Come on and have some fun! it's easy, just add your link. Today my husband and I are going to be downtown Sarasota for a motorcycle event call Thunder By The Bay. It's a nice day and I will take some photos. Edited to add: Okay the Linky is ready to go so keep on adding your recipes! I enjoy today's menu alot! Loving all the fingersfood. Yummm.... Have a great time all! And you too, enjoy your trip. Wow what an amazing array of food. I must come back to check them out one by one! Sure wish I lived in your little corner of the world. That food looks terrific and yummy too. Oh wow..everything looks yummy..Have a great day!! Yeah!!! It's tailgating time. We are focused on the college bowl games. the dishes look amazing! I would love it all. Oh I am so there daaaaahling, I'll take one of each please! Thank you everyone for the comments and thanks to everyone who joined in! See you next week! This is perfect for our Tailgating! !